Here you will find a collection of New Zealand flag printables including a New Zealand flag colouring page, jigsaw, notebooking pages, bookmarks and printable flags of all sizes. You can use them for learning about New Zealand, or perhaps for supporting New Zealand in sporting events, or on Waitangi Day! The New Zealand flag is blue with a Union Jack in the top left corner, and four red stars with white borders on the right representing the constellation of Crux, the Southern Cross. New Zealand is the theme for this booklet. Make it yourself by printing out the page and then folding according to these instructions. Search for origami booklet on the website for further instructions. The interesting flag of New Zealand graces these useful bookmarks. Print out one of the versions below and hand out as class prizes or rewards. 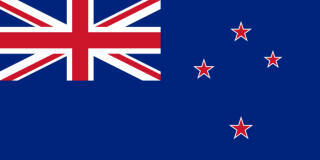 New Zealand has a flag which is great for colouring. Refer to our other flag printables to make sure you get the colours right! Jigsaws are a great way to get children familiar with world flags, and there are a lot to get to know! Just for fun, we've flood-filled our kiwi frame with the New Zealand flag. I hope you like it! Record your knowledge of New Zealand on this notebooking page. You could make a file of countries or just keep a record of what you've learned about this country.